It must be true love...did I REALLY marry this guy?? Wow. How much is he going to pay you to delete this post? Hee Hee! I just did it to see the look on his face after he reads it. I can't wait! You know that look when they try to be mad but they are slightly embarassed to admit that you were funny...at their expense! There's just a slight smile and twinkle in his eye as he tries to call me a naughty name. Too bad he is sleeping...can't wait until the morning! Nice Gina, Am I going to have to start editing your Blog? I know your password! hilarious. and yes, you really did marry him. The sad thing is that I actually took this picture of myself. It was in response to a picture Curtis took of himself and sent out of him getting his hair dyed. 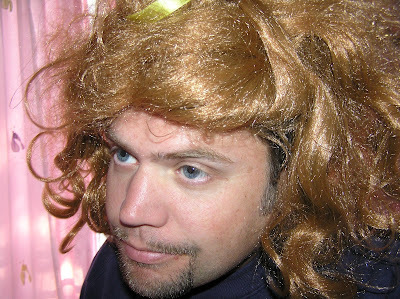 I put on Megan's Belle wig and tried to recreate the pose to make fun of him, looks like the joke is on me. Yeah Yeah...blame it on Curtis!